TESCORP’s “CVR-Mini” Series VRU system for application to meet EPA CFR 40, Subpart 0000 regulations and our customers’ stock tank vapor recovery gas emission requirements. 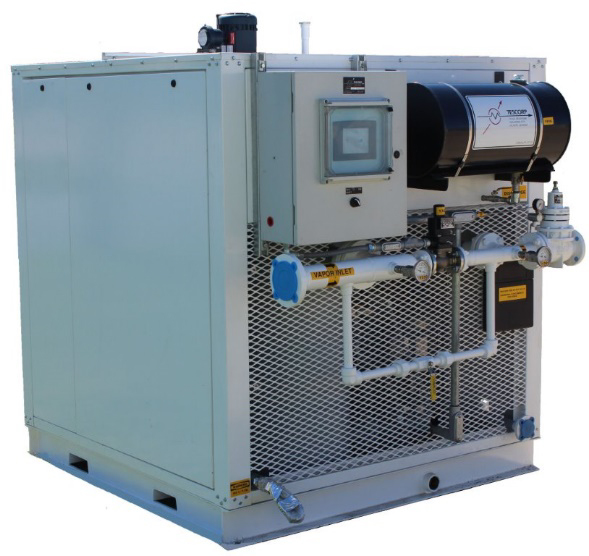 Designed and constructed for “wet” gas applications utilizing a rugged single-stage rotary vane compressor. TESCORP’s “CVR-M” & “CVR-MH” are compact, self-contained, fully automated VRU systems complete with gas cooling, “load/no-load” capacity control with sophisticated PLC control logic with customer “DCS” communication. Liquid cooled, Oil Lubricated, Single-stage rotary vane compressor utilizing mechanical seals and heads designed for saturated gas applications. Complete Force feed lubrication system including a 15 Gal. oil storage reservoir, progressive flow type divider block, manifold & filter. Controls include flow indicators & monitors. NEC Class I, Div. II, Premium ef ciency TEFC 460 VAC/3 Ph. /60Hz electric drive motor. VFD ready. ASME Code, Section VIII Suction scrubber. 316 SS mist eliminator, condensate level controls with pump for rated ows & pressures. Gas After -Cooler with 30o approach to ambient and a closed loop compressor jacket water cooling heat exchanger assembly. Unit Control Panel per NEC Class I, Division II, Class B,C, & D w/ Tescorp’s vapor recovery logic, controls and DCS comm. 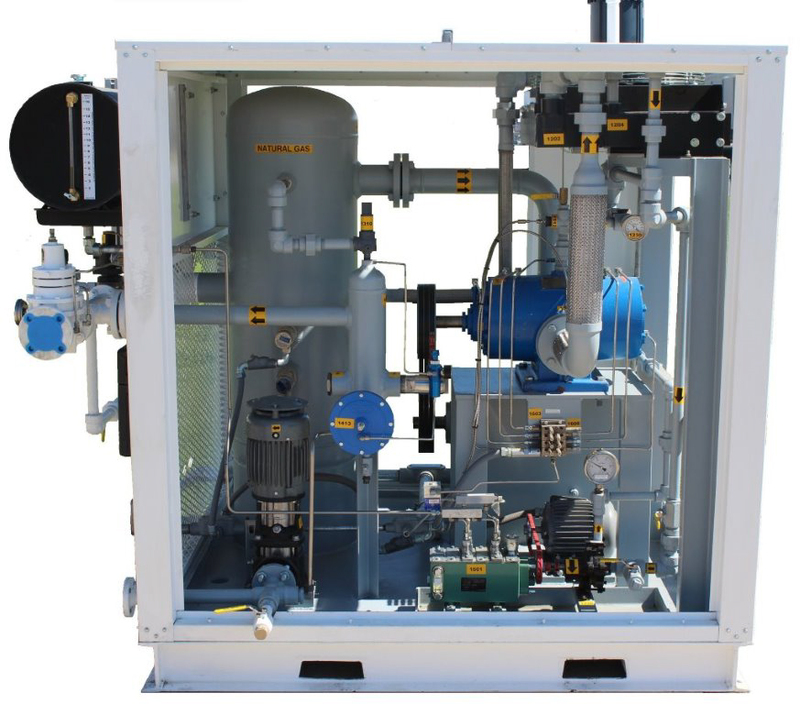 Port CVR-M’s skid and enclosure are designed for harsh oil field conditions. Wiring per NEC Class I, Div. II, Class B, C, & D on all electrical components for safe operation. Compressor options include Double-Bellows mechanical seals. The CVR-M Series Vapor Recovery Unit utilizes a single-stage rotary vane compressor with minimal once through oil lubrication. This eliminates the damages associated with liquid contamination of the lubrication and maintains temperatures in excess of the gas “dew-point”.